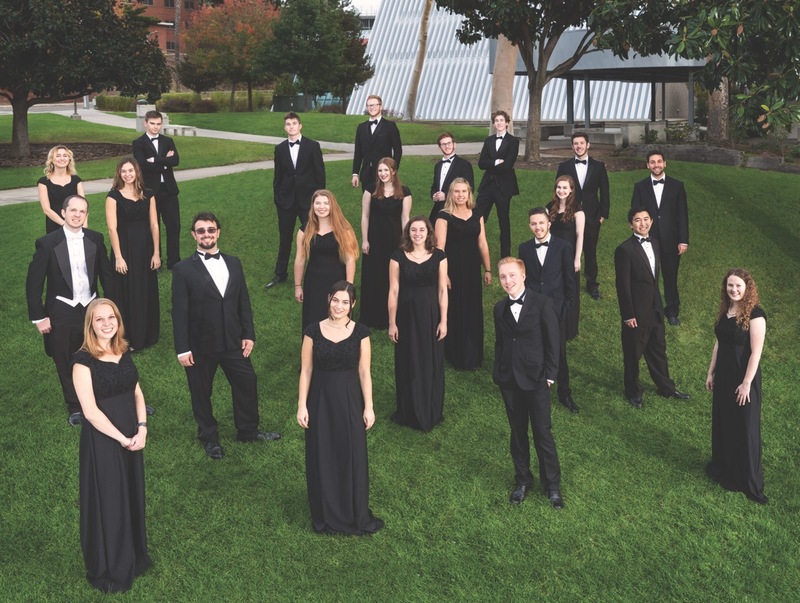 SAN LUIS OBISPO — The 24-member Cal Poly Chamber Choir will present a concert of two requiems at 8 p.m. Saturday, May 11, in the historic Mission San Luis Obispo de Tolosa. The concert will open with the spectacular and rarely performed “Musikalische Exequien” (“Funeral Music”) by Heinrich Schütz. Composed in 1636, the piece is a three-movement monument of the early Baroque Period. Through various scriptural passages and choral texts, the work was composed for the funeral service of Prince Heinrich II “Posthumous” von Reuss, a friend and benefactor of Schütz. “Listeners will be treated to a variety of choral textures in this hauntingly beautiful work,” said Scott Glysson, Cal Poly director of choral activities. The second half of the concert will feature John Rutter’s “Requiem.” Completed in 1985, it’s one of Rutter’s most well-known works. It combines elements from the traditional Latin text of the requiem service with modern English. The performance will feature a seven-piece chamber orchestra of Cal Poly students and professional musicians, including music faculty member Samuel Shalhoub, lute. Paul Woodring is the accompanist for the choirs and will play organ for the concert. Glysson, the concert’s conductor, will travel to New York with 34 Cal Poly students — including five from the Chamber Choir — to perform at Carnegie Hall on May 25 as part of MidAmerica Productions’ 36th concert season. The Cal Poly Choir members and the Vancouver Bach Choir of British Columbia will collaborate on performances of Joseph Haydn’s “Te Deum (for Empress Marie Therese)” and Wolfgang Amadeus Mozart’s “Sparrow Mass,” (Missa brevis in C major). Glysson will conduct the Haydn piece. Tickets for the May 11 concert are $14 for the public and $9 for students. Tickets are sold at the Cal Poly Ticket Office between noon and 6 p.m. on Monday through Saturday. To order by phone, call SLO-4TIX (756-4849). Tickets will also be sold at the door the night of the concert. A 10 percent discount is given to patrons who buy season tickets to four Music Department events through the Cal Poly Ticket Office; a 15 percent discount is given on tickets to five or more events.